Look at the image of a town by a stream. What this photograph shows us, and what we can know only by further research, is that this is a detail section of a much larger image known as the Barada panel. 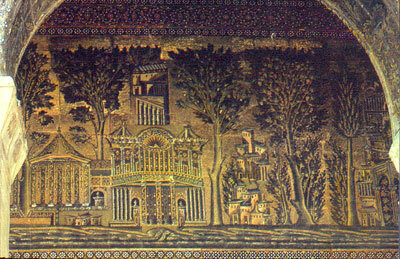 The panel depicts many townscapes along a riverbank identified as the Barada River that flows through Damascus, Syria. The full panel measures 34.5 meters in length and 7.15 meters wide (115 feet x 23.8 feet). 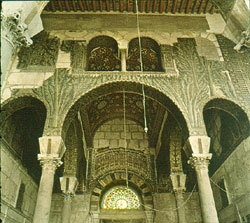 The panel shown here is five meters (16.7 feet) above ground level on the wall in the courtyard of the Great Mosque in Damascus. Knowing these details indicates to us that the original image was to be perceived from a distance and from belownot as an image in a book, as most students see it today. The original image is created in mosaic technique. Choosing to execute an image in mosaic involves setting thousands of small pieces of glass, ceramic, or stone into mortar. In antiquity (the technique was invented in the Mediterranean basin in about the 4th century BCE), the individual pieces used to compose the mosaic were usually of standard size. As the technique gained in popularity and spread, mosaics were often made of pieces of different sizes and shapes like the pieces of a puzzle. Mosaic is a difficult technique requiring extraordinary time and labor and can be used on the exterior of a structure, but is most frequently used on interior or partially covered areas, often to protect the mortar. This particular mosaic was created in the early 8th century of tesserae glass mosaic, cubed shaped pieces of about one cm (.5in). In the Middle Ages, glass was an expensive mosaic medium, second only to precious stones. Glass provides luminous colors that reflect light, an important reason for choosing this medium as it enhanced the natural light, candle, and lamplight available in buildings of that period. The medium of the images made them visible in the minimal light of the buildings that they in turn enhanced, glowing from the reflection of the light. Today, with electric lighting, mosaics are often made of less expensive and less labor-intensive material. When we analyze an intricate image such as this mosaic, historians often pay as much attention to the many trained artists who made this image as we do to the content of the image itself. Paying attention to the ways that a wall was transformed into a luminous landscape by the application of hundreds of thousands of glass cubes tells us much about the technological and artistic skill as well as the resources and cultural values of a given society.